If you’re creative, you can make your passion projects count for college credit. Somehow [InfinityTable] managed to use this infinity bartender build called BarT as a senior design project. There’s a lot going on here, starting with the cabinet which is 30″x30″ and has some custom mirrored glass necessary because of a square cut-out in the middle of the front pane. The two mirrors face each other, with a strip of LEDs in between which accounts for the “infinity” part of the build. This is popular but usually it’s usually just the mirror and lights. In this case that special cut-out is a cubby for a glass. Place it in there and the rest of the build will mix you up a tasty beverage. There is a second chamber in the enclosure behind the rear mirror. This houses the components that mix up the drinks. Raw materials are dispensed from 1.25L plastic bottles. The extra special part of the build is that since it is a senior project, all the driving circuitry uses roll-your-own boards. After getting access to a Lulzbot 3D printer, [Tim] designed a 3D printable peristaltic pump. The design was done in OpenSCAD, which makes it parametric and easy to modify. Peristaltic pumps work by squeezing a length of tubing to push fluids. This mechanism is similar to how your intestines work. The pump provides an isolated fluid path, which is why they’re commonly used in medical and food grade applications. Like many products in the medical space, these pumps tend to be rather expensive. Being able to print one for your own projects could save quite a bit of cost. The pump is based on [emmett]’s gear bearing design. One nice thing about this design is that it is printed preassembled. Pop it out of the printer, add some tubing, and you’re ready to pump fluids. On top of the isolated fluid path, this pump gives accurate volume measurement. For that reason, we can imagine it moving booze for a robotic bartender build. After the break, a video of the pump moving some fluid. After five weekends of work, [Alex] completed his automatic drink maker, the RumBot. What makes this automated bartender different from others is the fact that it is fast. VERY fast. It can serve drinks to five different locations in as little as 3 seconds per drink. By [Alex]’s estimation, this could keep a party of 100 people going without anyone waiting on a drink. Drink selection itself is handled by a simple digital I/O on an Arduino with a 1950s-styled user interface. The frame is built out of wood and uses 3D Printed plastic parts. It houses a very robust servo on a belt screw-driven stage to move the drink nozzle, and special sensors placed at either of the five drink locations detect a cup ready to be filled. Any cup placed at any of the positions will automatically be filled based on the RumBot’s settings at any particular time. 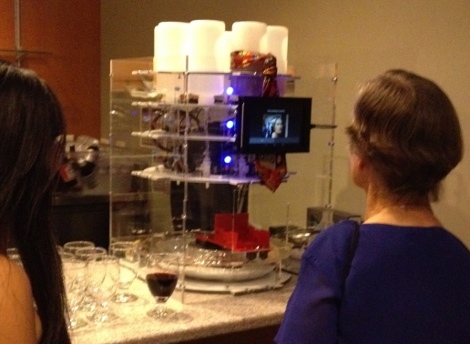 Here’s an amazing conference we really wish we could have been at — Barbot 2013: a celebration of booze serving robotic masterpieces. Lucky for us though, the folks over at Evil Mad Scientist did have the opportunity to attend — and they took lots of pictures. There is just so much awesome it is hard to pick our favorite barbot, but the one shown above is definitely a contender. It’s the Schrödinger’s Martini. While the box is closed, the amount of vermouth poured is indeterminate until observed. Classic. Another one that popped out at us was the 500SW, which became more affectionately known as Dance Dance Intoxication, which apparently judged you based on your dancing skills and then poured you a drink — appropriate to your moves. Click through and see for yourself, but here’s a couple other related posts from our past, remember the Cooler Master Advanced Beer Delivery System? How about the amazing conveyor belt driven, alcohol dispensing Inebriator? There are just so many ways to have fun with the concept it’s hard not to try your hand at building one at home. Back in 2002, [Dave] came across a discarded PUMA robotic arm and quickly set his sights on turning it into a bartender to serve drinks at his parties. Unfortunately, the arm was far from operational and being an engineer at his day job meant that working on this project was the last thing he wanted to do when he came home. So, progress trickled along slowly for years. He eventually announced a public deadline to spur him to action, and this years Pi(e) party saw the official debut of ‘Sir-Mix-a-Bot’ – the robot bartender. With the exception of having to build a new hand for it, mechanically, the arm was still in good condition when [Dave] found it. The electronics were another story however. Using some off the shelf components and his own know-how, [Dave] had to custom build all the controls. The software was written from scratch as well. (He lucked out and had help from his brother who was taking a Ph.D. program in robotics at the time). As if the robotics aspect of the project wasn’t enough, [Dave] even created a beautiful custom table that both houses and displays his masterpiece. The quality of craftsmanship on his table alone is worth the time to check this out – there’s a short video after the break. Having an open bar usually means hiring at least one bar tender. But this hack does away with those labor costs (and someone to make sure your teenage cousins aren’t drinking) by putting a robot in charge of things. But the fun doesn’t stop there. One of the features of this bartender is that it records a 30 second video every time it dispenses a beverage. We’d image these get a bit funny as the night wears on before taking a dramatic turn into sadness. The link above shares a ton of details on the device so make sure that you click-through the different pages in the navigation bar. The mechanical page shows off all of the effort that went into designing the machine in Solidworks. The ingredients start on the top layer in inverted bottles. Each feeds to a valve which has its own nozzle. Like a round version of the Inebriator, a glass is placed in a trolley at the bottom that pivots around the center of the machine. Once it gets back to the opening in the acrylic case you can grab your drink, give it a quick stir, and off you go. Check out the video after the break to get a look at the user interface which includes that recorded video greeting for the happy couple. The robotic bartender, lovingly named the Inebriator, is a work of mastery. We think you’ll be surprised by the simplicity and grace of its beverage dispensing system. The most obvious part is the lineup of nine liquor bottles across the top with LED backlight for style. Each has a valve on it that is meant to be pressed on by the rim of a glass in order to dispense its payload. To dose the glass with alcohol the Inebriator drives a trolley along one axis beneath the line of bottles. When in position it has an actuator arm the rises up and depresses the bottle’s valve mechanism. Once all the liquor is in the glass it moves to the left side to be topped off with mixers. These are stored in bottles in a cooler under the table. They are pressurized with nitrogen, and an electronically actuated value lets the liquid flow. Drinks are selected on a character display, and there’s a weight sensor in the trolley to ensure that a drink isn’t mixed without a vessel to receive it. You don’t want to miss seeing this in action after the break. David Troetschel has updated the project titled Geometer.